My friend Josh Mamis, who publishes the New Haven Advocate, asked me to come to their offices and judge Christmas decorations. Is there a job I am less qualified for? The Advocate is a weekly tabloid devoted to local arts and entertainment. It is often the best place for ‘bite the hand that feeds me’ expository journalism on local politics and business. I always enjoy reading their longer feature stories. In the past, the Advocate had been very unkind to my station in a story that I felt was vindictive and a maybe little heavy handed (though they were always nice to me…. even in that article). Though once locally owned, it recently become part of Times-Mirror which also owns the Hartford Courant and Channel 61. Josh knows I have a soft spot in my heart for print in general and the Advocate specifically. Though TV has more impact and is much more immediate, the written word has an elegance and permanence that TV can’t touch. That’s probably why I enjoy writing this blog. I drove into Downtown New Haven and parked under the Omni Hotel. Though cold, today was a beautiful day with high thin cirrus clouds adding some texture to an otherwise blue sky. 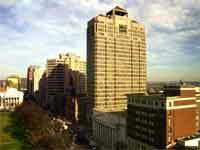 It is only in the past few years that New Haven has had a first class hotel downtown. I popped up to street level through the hotel’s lobby and walked around the block to the Advocate’s offices. They are located on the 11th floor of a building over what was the Chapel Square Mall. The building had fallen into disrepair, but looked very good today. Obviously, someone has spent the money to try and turn it around. The mall is long gone – a failure through a few incarnations. I was surprised to hear it had been converted to upscale apartments. What was the actual mall is now an enclosed courtyard with an open air roof and apartment entrances. Upscale apartments going into Downtown New Haven (and now a 4-screen artsy movie theater down the block) is another very good sign for the city. Josh’s office is near the receptionist and has a killer view of the Green and then north to East Rock&#185. Very impressive… especially so with today’s weather. We schmoozed for a few minutes and then it was on to the judging. To my eye, Christmas lights around Connecticut seem to less visible this year. The Advocate’s office maintained that trend. There really wasn’t a lot of cubicle decorating, though I did pick a winner. The winning cubicle featured a very scrawny little artificial tree but lots of other little homemade Christmasy type accoutrements. It was enough to show real holiday spirit. That won me over. I smiled… actually chuckled at that name. No one else did. The name “Group W Bench” only meant something to me. My age was showing again. “The Group W Bench” was made famous in the late 60s by Arlo Guthrie in his song “Alice’s Restaurant.” For 18 minutes Arlo told and sang the story of his arrest for illegal dumping… in the town dump… on a legal holiday… and led to his day at the local draft board. looking people on the bench there. Hey, it was the late 60s! Times were different and this story of a song became huge. I left the Advocate a little disappointed – not because they didn’t know Arlo, but because there weren’t more decorations to be seen. But I also left feeling a little better (and this is a continuing, incremental process) about New Haven. &#185 – At the end of the last ice age, as the ice retreated, huge chunks of rock that had been pushed forward by the glaciation remained in place. East Rock is one of these steep, sharp rock mountains. It overlooks New Haven Harbor and is a few miles from downtown. Every Thanksgiving my husband searches the radio stations to find who will be playing Alice’s Restaurant. He couldn’t find it this year and was very disappointed.